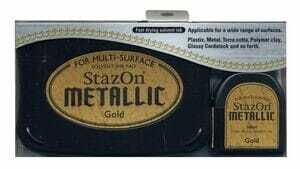 Gold - StazOn Metallic Ink Pad. Solvent pad for multi surfaces. Acid free Archival fast drying. For plastic, metal, terra cotta, polymer, clay, glossy cardstock and much more. Customer evaluation for "Tsukineko - Gold - StazOn Metallic Ink Pad"